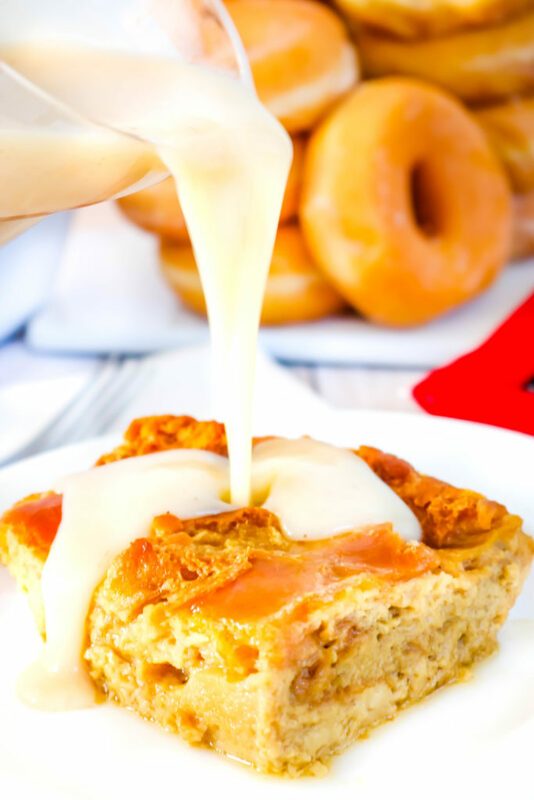 Kick your traditional bread pudding up a notch with the addition of glazed doughnuts! 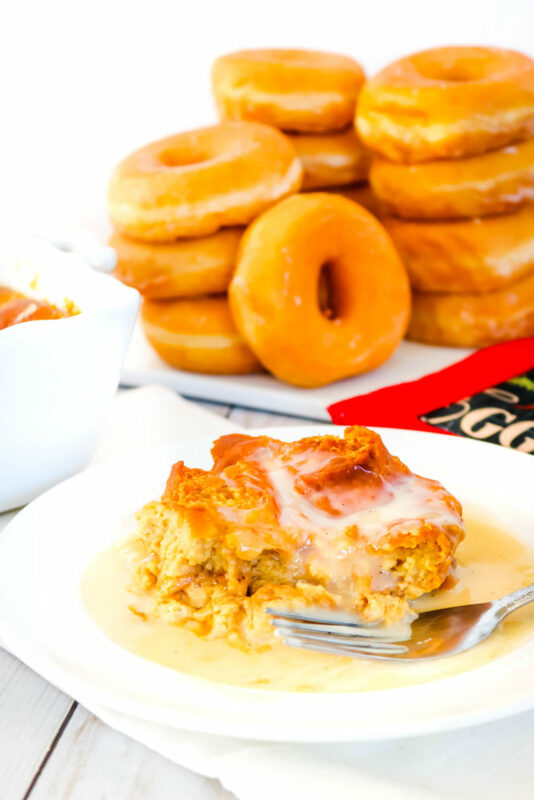 Doughnut Bread Pudding replaces french bread with glazed doughnuts for an over-the-top treat. Best of all, the doughnuts do not have to be fresh. 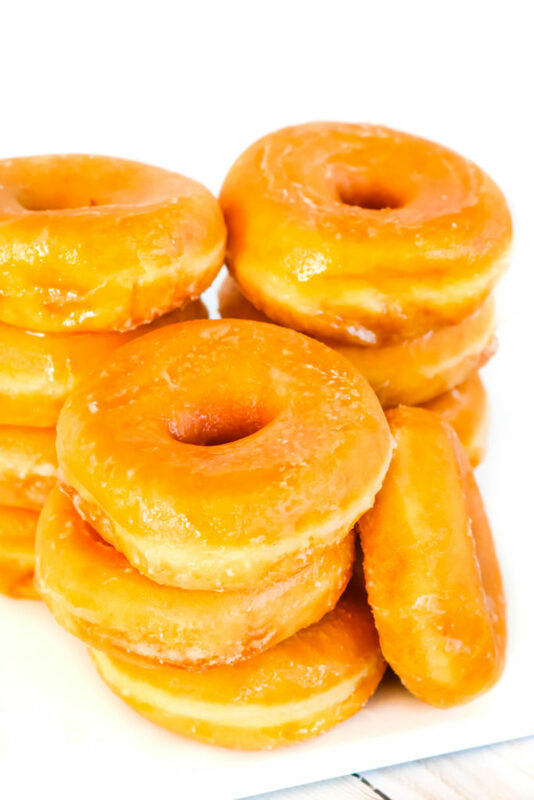 Stale doughnuts work just as well as those right out of the box. 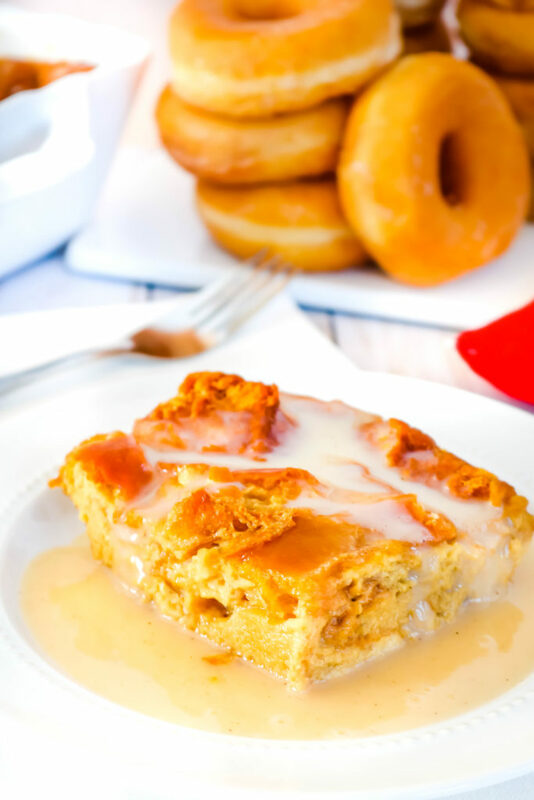 Doughnut Bread pudding might be one of the sweetest and most decadent desserts you’ve ever tried but let me tell you something, every bite is totally worth it. I fell in love with bread pudding about 9 or so years ago when a local chef introduced me to Jack Daniels Bread Pudding. It was love at first bite and I’ve been crazy about it ever since. 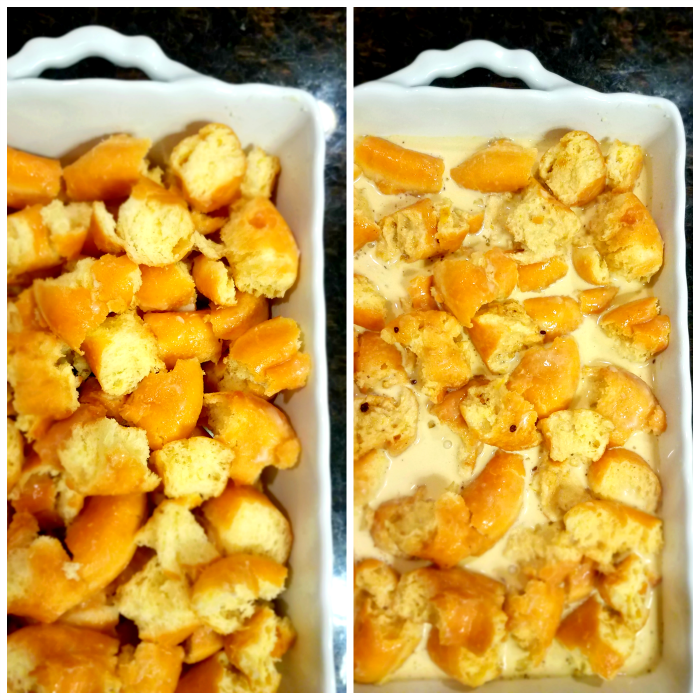 My mom is also crazy about bread pudding so I was more than delighted to share this fun recipe with her! 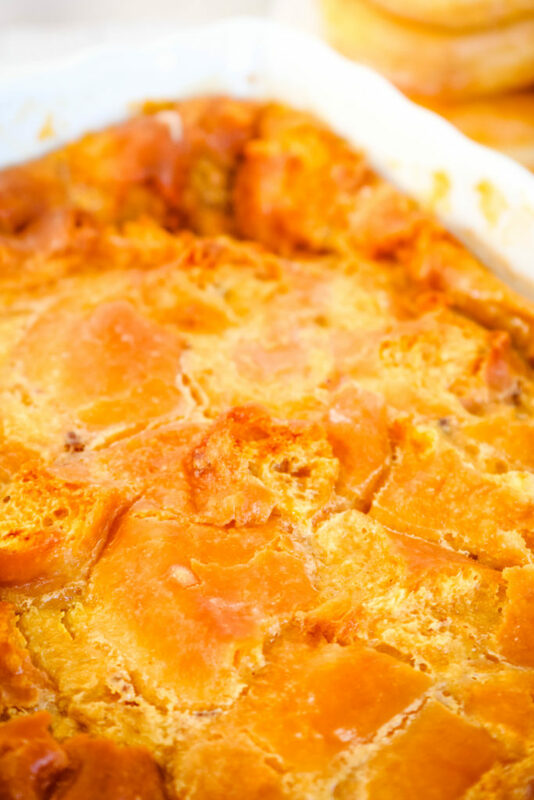 Bread Pudding here in the south is a sweet baked dessert that’s made up of bread and custard. It’s normally served with a sweet sauce but I’d also seen bread pudding served with ice cream. 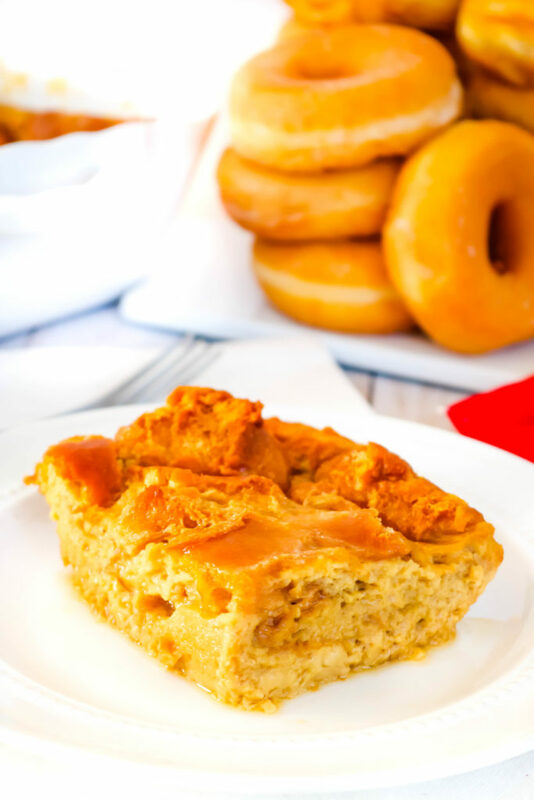 How is Doughnut Bread Pudding Different from Regular Bread Pudding? Bread pudding is normally made with stale/toasted bread or you can use sweet bread as I use in my Pineapple Bread Pudding. 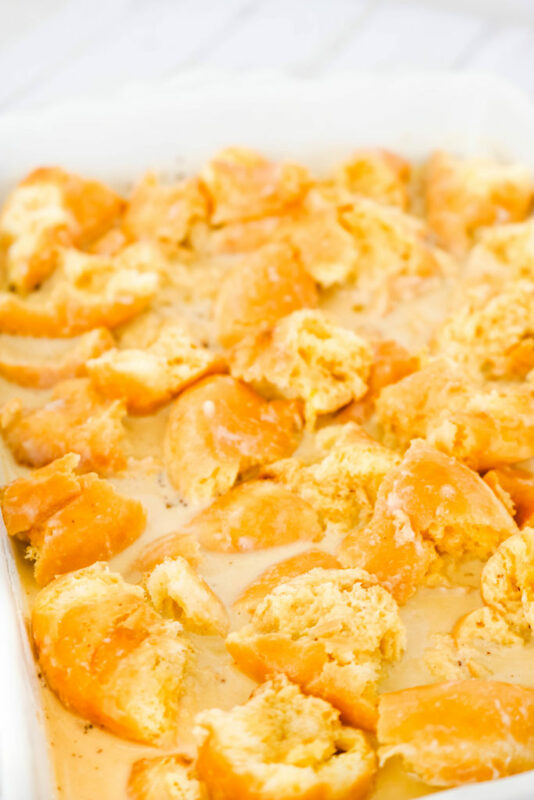 However, this bread pudding is made with glazed yeast doughnuts instead of bread. You can already tell that this is going to be an amazing recipe, right? Do the doughnuts need to be stale? I wouldn’t say that the doughnuts need to be stale but I like to use the ones from the grocery store that aren’t fresh off the presses. Of course, this will totally work with fresh doughnuts but I find the ones that were made 2 or 3 days ago soak up more of the custard. Let’s be honest, if you buy glazed doughnuts from the grocery store it’s very likely that they were made 2 or 3 days ago so you don’t really need to buy them and wait 2 or 3 days to make this. Do the doughnuts need to be glazed? No. The doughnuts don’t have to be glazed for this recipe but they should be yeast doughnuts. I haven’t tried this recipe with baked cake doughnuts. First, you’re really just going to cut or pull the doughnuts into large pieces and pile them into a 9×9 dish or a 2-quart rectangle baking dish. Then once the custard has been made, just pour that all over the doughnut pieces, making sure to pour it evenly. Once you’ve added the custard it’s time to let this bread pudding chill. Just wrap it in foil and pop it into the fridge. I always let my bread puddings sit in the fridge overnight or at least 8 hours. I know that some people make bread pudding and let it sit for just an hour or so but I was taught to let it sit and soak up as much custard as it can. When it’s time to bake the bread pudding, remove the foil and preheat your oven. There will still be a little bit of custard in the dish but that’s ok. It’ll puff up as it bakes and absorb even more of the custard. After about 1 hour and 15 minutes, the bread pudding should be done. The edges should be browned and center still a little jiggly when moved. Go ahead and remove from it from the oven and let it cool. There so many different glazes that you can make for bread pudding. You could make My favorite Jack Daniels glaze or maybe even a cinnamon rum glaze! Or you can make this fantastic vanilla glaze that I made for it. Those ingredients, a saucepan and a few minutes of heat are all that stand between you and vanilla glaze heaven. 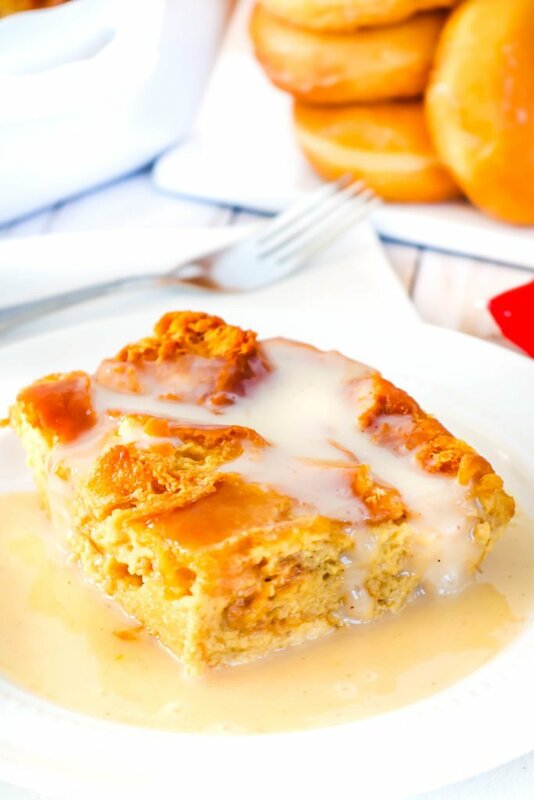 Just pour that warm vanilla glaze over a serving of doughnut bread pudding a get ready to bite into one heavenly dessert! 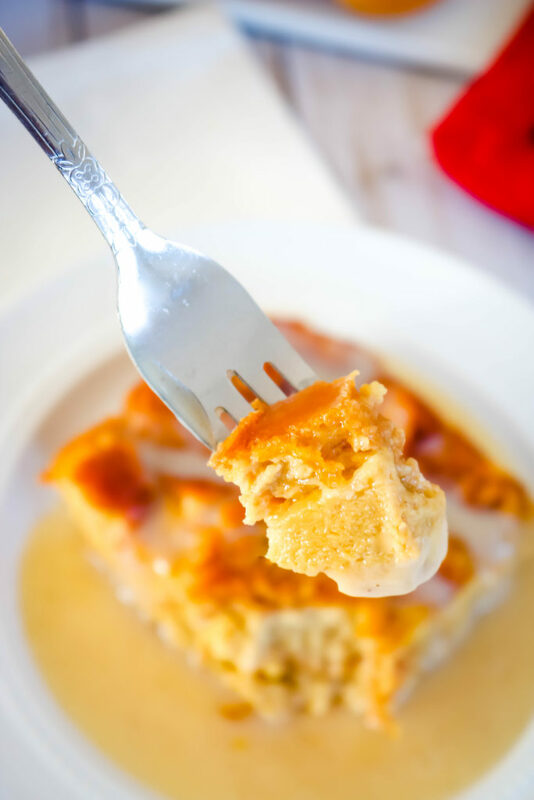 Now, of course, I wouldn’t suggest that you make this Glazed Doughnut Bread Pudding all the time but it’s the perfect dessert for an anniversary, a birthday or even Valentines day! Thomas and I are celebrating 12 years of marriage on Sunday and I know he’d be crazy happy for me to make this again! I wasn’t able to find the recipe for the custard. Also, what is cinnamon run glaze? BTW, Semper Fi to you and your husband. I was stationed at Pendleton and I always appreciated the Docs!